PYONGYANG, North Korea (AP) — North Korea's new leader addressed his nation and the world for the first time Sunday, vowing to place top priority on his impoverished country's military, which promptly unveiled a new long-range missile. The speech was the culmination of two weeks of celebrations marking the centenary of the birth of his grandfather, national founder Kim Il Sung — festivities that were marred by a failed launch Friday of a rocket that generated international condemnation and cost North Korea a food aid-for-nuclear-freeze deal with Washington. Kim Jong Un's speech took North Koreans gathered at Kim Il Sung Square and around televisions across the country by surprise. His father, late leader Kim Jong Il, addressed the public only once in his lifetime. Appearing calm and measured as he read the 20-minute speech, Kim Jong Un covered a wide range of topics, from foreign policy to the economy. His speech, and a military parade that followed, capped the carefully choreographed festivities commemorating Kim Il Sung's birthday, which included a massive fireworks display. It was the best look yet the outside world has had of the young Kim, who is believed to be in his late 20s. 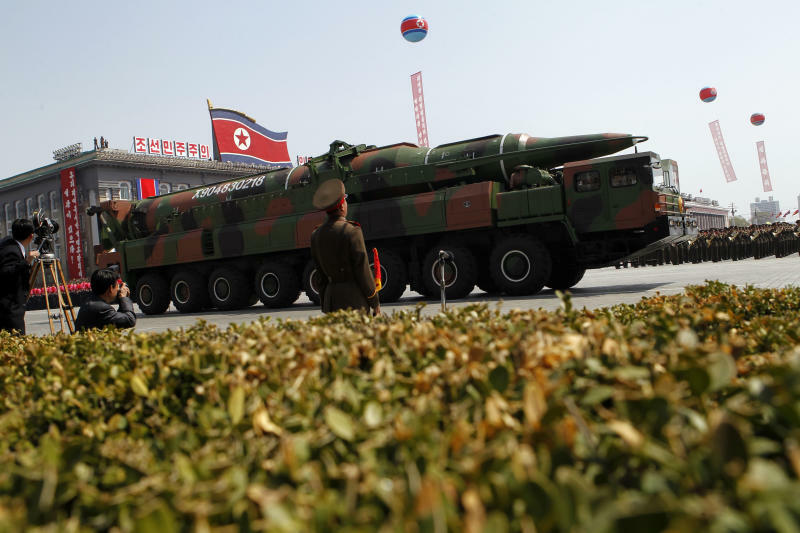 Punctuating Kim's message that the North will continue to pour funds into its military, the parade culminated with the unveiling of a new long-range missile, though it's not clear how powerful or significant the addition to the North Korean arsenal is. Some analysts suggested it might have been a dummy designed to dupe outside observers. Although the rocket launch Friday was a huge, costly embarrassment for the new leadership, Kim's address was seen by analysts as an expression of confidence by the young leader and meant to show that he is firmly in control. "Superiority in military technology is no longer monopolized by imperialists, and the era of enemies using atomic bombs to threaten and blackmail us is forever over," Kim said. His message suggested no significant changes in national policy — the "Military First" strategy has long been at the center of North Korea's decision-making process. But there was strong symbolism in the images of the new leader addressing the country on state TV and then watching — and often laughing and gesturing in relaxed conversation with senior officials — as the cream of his nation's 1.2 million-strong military marched by. Outside analysts have raised worries about how Kim, who has been seen but not publicly heard since taking over after his father's December death, would govern a country that has a nuclear weapons program and has previously threatened Seoul and Washington with war. At the celebration of Kim Il Sung, he appeared to clear his first hurdle. The speech was a good "first impression for his people and for the world," said Hajime Izumi, a North Korea expert at Japan's Shizuoka University. "He demonstrated that he can speak in public fairly well, and at this stage that in itself — more than what he actually said — is important. I think we might be seeing him speak in public more often, and show a different style than his father." Kim said he will strengthen North Korea's defenses by placing the country's "first, second and third" priorities on military might. But he said he is open to working with foreign countries that do not have hostile policies toward his nation, and said he would strive to reunify Korea. 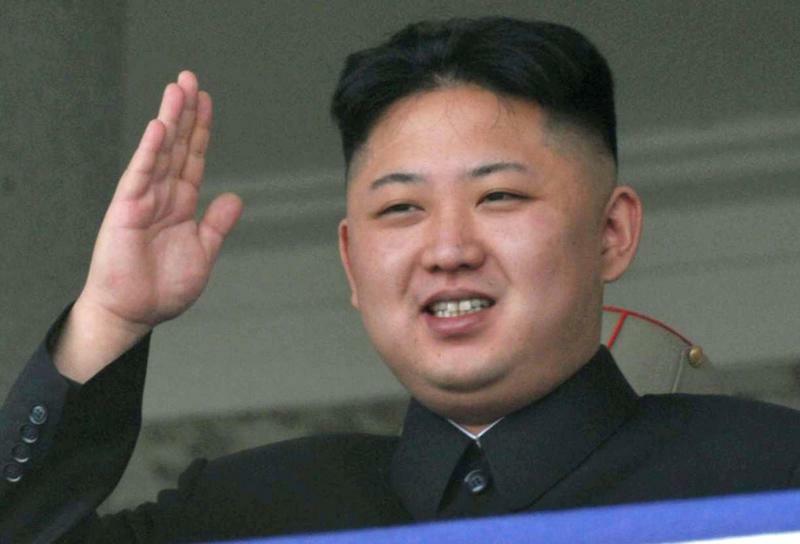 He also stressed the importance of national unity, calling his country "Kim Il Sung's Korea" rather than North Korea. "That suggests to me that they want to let the country, and the world, know that this is a 'new' country," said Han S. Park, a University of Georgia professor who works frequently with top U.S. and North Korean officials, after watching the events in Pyongyang. Despite his youth, Kim has been groomed since his teens to step into this role, Park said, citing conversations with North Koreans with knowledge of the leader's personal history. Cha Myong Hui, a journalist with the government-run Minju Joson newspaper, said she was struck by how much he resembles his father and grandfather. "I can tell you every person in my country cried when they heard his voice," she said. The young leader said he will aggressively pursue economic growth to improve people's daily lives. North Korea has suffered decades of economic hardship following a famine in the mid-1990s and the loss of aid from the Soviet Union. Kim Jong Un's formal three-year succession has coincided with a push to improve the economy by employing modern technology. Kim made no direct mention of the rocket failure. But North Korea's state media made an extraordinary announcement hours after the launch, saying that the attempt to send a satellite into space had flopped. It still claims past launches succeeded, which international experts deny. Concerns remain high that North Korea may now feel itself under pressure to make up for the botched rocket launch with a nuclear test — as it did in 2006 and 2009. The finale in Sunday's military parade added to the worries over North Korea's military. But analysts in Japan and South Korea said further examination is needed to determine whether it's a new intercontinental ballistic missile that North Korea reportedly has been building. Narushige Michishita, a North Korea military expert at Japan's National Graduate Institute for Policy Studies, said the missile appeared to be new, but strongly resembled the rocket used on Friday and also the long-range Taepodong-2, which North Korea first launched, unsuccessfully, in 2006. He said it probably has three stages but did not appear to be big enough to have the 15,000-kilometer (9,000-mile) range needed to effectively attack the United States, which would be the goal of an ICBM for the North. "I don't think this is a serious ICBM," Michishita said. "Putting it on display has a psychological impact, and that would have been greater if Friday's launch had worked. But North Korea has a very bad record with long-range missiles. It think this is more a propaganda ploy than a military advance." 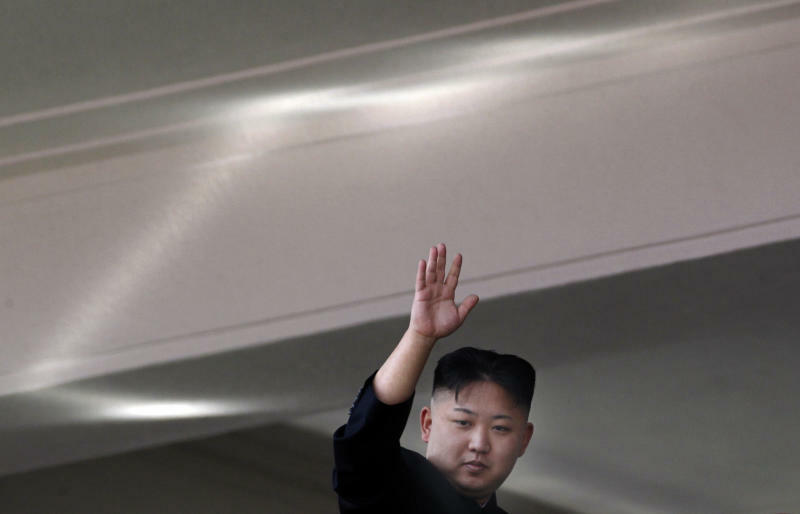 Associated Press writers Sam Kim, Foster Klug and Eric Talmadge in Seoul, South Korea, contributed to this report.